Percy Sledge was born in 1941 in Leighton, Alabama. During the 60s he sang in an R&B group called the Esquires at the weekends, whilst working as a hosptial orderly through the week. After many years of struggling to get himself a recording deal, he was finally discovered by DJ-turned-producer Quin Ivy. Ivy had recently set up Norala, a small recording studio and record label modelled after the success of Rick Hall's Fame Studios (and apparently all done with the blessing and encouragement of Hall himself, who was happy to send the work overflow at the busy Fame Studios in Ivy's direction). At Norala, Ivy began working with Sledge on the song that has first captured his attention, and over several weeks they developed it into a finished product. The band featured on the record consisted of organist Spooner Oldham, bassist Junior Lowe and drummer Roger Hawkins, all on loan from Fame, plus guitarist Marlin Greene (who had originally been at Fame but had moved to Norala to act as Ivy's right hand man, and was a co-owner of the label). With the overdubbing of some backing vocals and horns, the song was finished, and with Rick Hall's help was leased to Atlantic Records for national distribution in 1966. 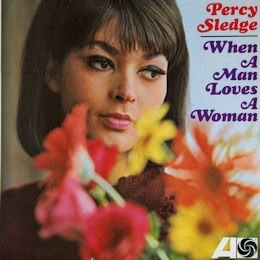 "When A Man Loves A Woman" became a huge surprise hit, even more impressive considering it was Percy Sledge's first release. It got to #1 not only on the R&B singles chart but also on the Billboard Hot 100, making it a true cross-over success. It also charted at #4 in the UK. Percy Sledge's career was launched, and he was quickly signed to Atlantic. A follow-up album was quickly put together to capitalize on the single's success, featuring a fine selection of southern soul numbers with which Sledge was able to introduce himself.